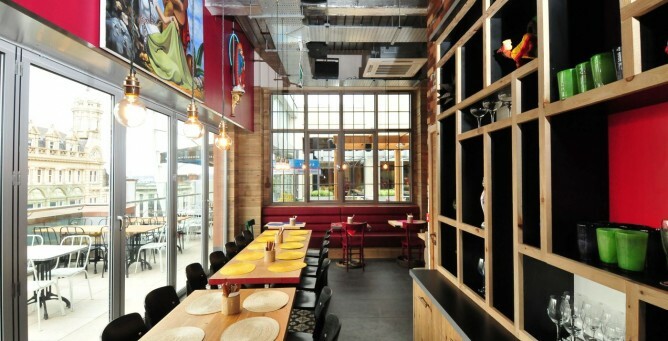 Restaurants in shopping centres. Huddled together on a godforsaken level above the shops in a homogenized open plan culinary hell. Okay, that sounds harsh: lets just say open plan hell. It’s safe to say that I’d leave well alone and even when the children were of an age where a trip to a shopping mall normally meant a pit stop, we’d be out of there pretty sharpish. A particularly nasty incident still rankles well over ten years ago in the Trafford Centre in Manchester (don’t ask). So when Leeds Trinity shopping centre in the city centre opened earlier this year, my hopes for anywhere half decent to eat were pretty low. But we have been proved wrong. The foodie ambitions of the centre development and management have been pitched well above the usual mediocrity. The centre is home to a Conran restaurant and cocktail bar, which are not half bad, a couple of cool ‘must visit’ bars whose popularity is proven by the long lines every weekend. Of course there are the usual Giraffes, Wagamamas, Carluccio’s et al but nestled in amongst this fearsome competition is an independent Mexican place called Cielo Blanco. Did you spot the odd word out in that last sentence? In a shiny corporate retail edifice like Trinity Leeds? Well, hats off to Trinity for seeking out the independents and double hats off for the folk behind Call Lane institution Neon Cactus for having a bloody great go at serving the best Mexican food and drink in the city. On top of this, Cielo Blanco boldly claims to be the ‘first authentic Mexican restaurant in Leeds’…I wonder what our friends at Pinche Pinche have to say about that? I’ve been a couple of times and both occasions were top drawer. 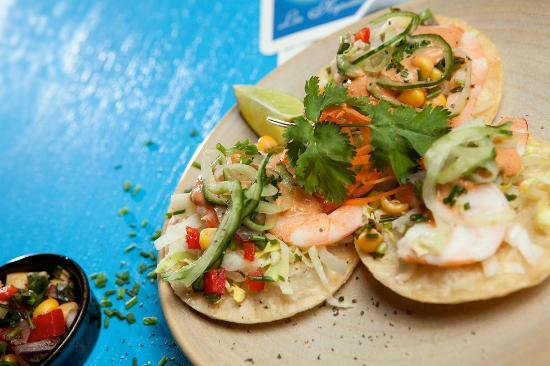 Fresh, zingly flavours, light street food, hefty hangover-curing burritos, pitch-perfect margeritas and a great setting all contribute to a real feel-good restaurant and bar. It helps of course if you’re a fan of Mexican food and this isn’t old fashioned tex mex stodge from back in the day, it’s light, almost tapas-like. Both times we sat outside in the mall (and that’s not as horrible as it sounds) as even on a cooler afternoon, it was very pleasant. Service is informal, iPad-led and although the style is laid back, the reality is brisk efficiency. Right up my street. Prices are good to say they will be paying through the nose for their location and the regular footfall of hungry customers must tell them they made the right call opening their doors in the largest retail development to open in Europe this year. There has been a lot of talk about how Trinity and its new shiny places is stealing custom from the city’s other restaurants. I think it’s really simple – if your existing customers think for whatever reason you don’t care about them via poor service, environment or indeed food, then they will vote with their feet. Yes, there will always be the new place to go and try. I firmly believe as a regular customer in the city’s best restaurants (and I don’t mean expensive), these are few and far between and a city the size of Leeds is still poorly served in terms of quality and breadth of provision. Because of this, I believe the mediocre will suffer and places like Cielo Blanco will flourish, because if they continue to do what they do well, they will be rewarded with return custom. I’d say don’t be put off by the fact that you’re sat on top of a shopping mall with shoppers shuffling zombie-like below. Imagine, like we did, that we were sat on a sunny street corner in Mexico and you’ll be just fine. This entry was posted in Leeds, Mexican by phildean1963. Bookmark the permalink.